Gunthorpe is a small parish in the north of the county. Settlement in the parish is focused on the two small villages of Gunthorpe, in the south of the parish, and Bale, in the north. Bale comes from the Old English meaning ‘a woodland clearing where there are springs used for bathing’. Gunthorpe means ‘outlying farmstead of a man named Gunni’. There is some evidence for early occupation. Prehistoric flints (NHER 24568, 24620, 25954, 32783 and 34368) have been found scattered throughout the parish. Mesolithic flints (NHER 3176), a Mesolithic pick (NHER 24752) and Neolithic axeheads (NHER 3177 to 3180 and 21264 to 21266) including a Scandinavian axehead (NHER 24636) have been recovered during fieldwalking and on the surface of fields. A Bronze Age axe (NHER 24620), a dagger (NHER 28295), a Middle to Late Bronze Age rapier (NHER 30982) and a Late Bronze Age knife (NHER 42641) have also been found by metal detecting. A Bronze Age round barrow (NHER 3181) was marked on a 19th century Ordnance Survey map, but the barrow is no longer visible as an earthwork. Two silver Iron Age coins (NHER 31632) were found by a metal detectorist in 1996 or 1997. In 1943 a hoard of over one thousand silver and copper alloy Roman coins (NHER 3182) was found. Metal detecting on the site has recovered a large amount of Roman coins and other metal finds that indicate that it was the site of a settlement during the Roman period. Roman coins (NHER 3183, 15616, 31629, 31630 and 33361), metal finds (NHER 24568, 24620, 30982 and 31631), pottery (NHER 21490, 24565 and 25954) and tile (NHER 28847) have been found by metal detecting and fieldwalking. The sites of three Early Saxon inhumation cemeteries (NHER 21925, 24620 and 32821) have been discovered by metal detecting. Early Saxon brooches and other personal objects were recovered from all three sites. 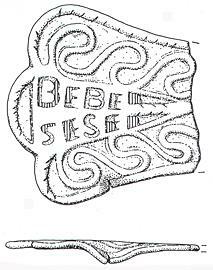 Early Saxon brooches were found on the site of the Roman settlement (NHER 3182). Other Early Saxon brooches (NHER 19796, 24568, 25135, 30982 and 31632) and pottery (NHER 19796, 25135 and 28295) have also been found. Metal detecting has recovered an Early or Middle Saxon pin (NHER 31629), a Middle Saxon brooch (NHER 24568), pottery (NHER 31635), Late Saxon metal finds (NHER 24568) and Late Saxon pottery (NHER 21490, 24564, 24565 and 25954). Both Bale and Gunthorpe are listed as small settlements in the Domesday Book and both were held by the King. All Saints’ Church (NHER 3206) in Bale dates mainly to the 14th century, and contains original medieval stained glass. St Mary’s Church (NHER 3209) in Gunthorpe also dates to the 14th and 15th centuries, and contains excellent examples of late 19th century stained glass. A chapel dedicated to St Botolph (NHER 14910) was founded during the medieval period, but had disappeared by the 18th century. The exact location of the chapel is uncertain. In 1971 the foundations of buildings (NHER 3186) that may date to the medieval period were uncovered next to a road in Bale. The earthworks of a medieval moat (NHER 3195) and associated outer enclosures are visible on aerial photographs and on the ground. The moat was probably the site of a manor house during the medieval period. An L-shaped medieval moat (NHER 3200) survives to the northwest of Bale Hall. A rectangular medieval moated site also survives at The Carr in Bale (NHER 1045). Some lengths of medieval retaining walls are still standing on the site. Clipstreet Farm (NHER 21004), Oak Farmhouse (NHER 21887), Boundary Farm (NHER 36963), Valley Farm (NHER 21890), White Horse Farm (NHER 21896) and Hall Farm (NHER 21005) date to the 16th or 17th centuries. Church Farm (NHER 15453) is a 17th century house containing reused medieval stonework. Bale Hall (NHER 15452) is an early 18th century house, incorporating elements of an earlier building. Gunthorpe Hall (NHER 3233) was originally designed by Sir John Soane in the 1790s and was substantially remodelled by Butterfield in the 1880s. There is an icehouse (NHER 3235) in the grounds of the Hall, which is surrounded by a late 18th century landscape park (NHER 33731). Sarah Spooner (NLA), 27 January 2006.